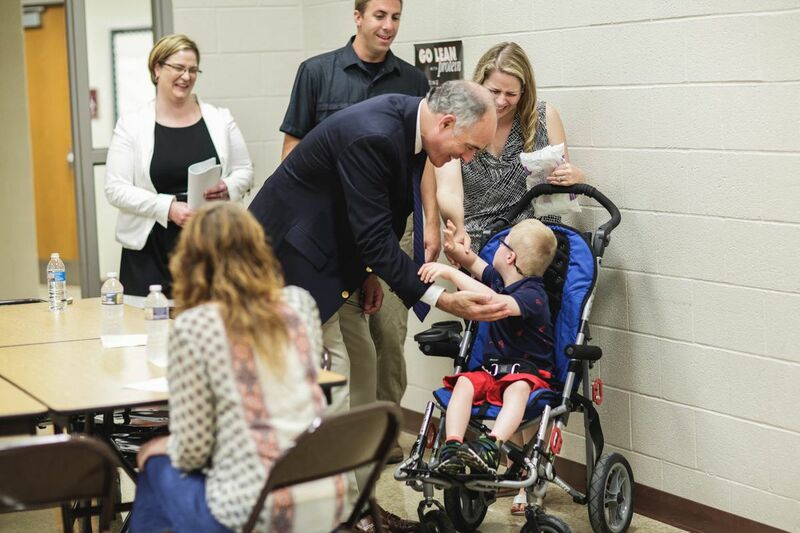 Sen. Bob Casey is a sponsor of legislation aimed at improving support for children with disabilities. Fear and hope. Pride and heartbreak. Sadness and love. Those are only some of the emotions of family members highlighted in the important Inquirer series "Falling Off the Cliff," as youth with disabilities move from school-age services into their adult years. The possibilities for young people with disabilities are endless, just as they are for our young adults without disabilities. The barriers are so much greater, but the challenges to families are not insurmountable with proper support. More than 40 years after the passage of the Individuals With Disabilities Education Act and 27 years after the passage of the Americans With Disabilities Act, a generation of young people with disabilities has grown up who have high expectations: to live on their own, to have a job, to become independent, to be active and valued members of their neighborhoods. All of those expectations and goals, however, can be dashed without the right supports and services. As the series points out, if you have to wait for decades for services; or there are not enough skilled, professional direct service workers; or there is no accessible transportation or housing, then the transition from youth to adulthood for a person with a disability can be a plummet over the side of a cliff for both the young person and his or her family. To avoid that cliff we need to do two things: Ensure community-based services and supports are available for young people with disabilities and remove as many barriers to employment as possible. First, we need to make community-based services for people with disabilities as available as institutional services. Right now, through the Medicaid program, our laws guarantee institutional care for adults with disabilities but do not guarantee community supports. As the Medicaid law is written, receiving supports and services in the community is based on a waiver granted by the federal government. The result is that almost half a million people around the country are waiting for services in their homes and communities. To make it possible for people with disabilities to live in the community with the supports they need, we need to amend the 1965 law that created Medicaid so that community-based supports are a right, enabling people with disabilities to choose to live in the community that will best enable them to succeed and to thrive. The Disability Integration Act (DIA), which I and 15 other senators support, would change that. It would ensure that community-based services are a right as a matter of law, just as institutional support is now. It makes little sense that under current law institutional care is a right but community living is a benefit rationed only to a portion of those who seek it. The benefits of this would go far beyond stopping youth with disabilities and their families from falling off the cliff. Of course, all of this is meaningless if the budget passed by Republicans in October becomes a reality. If that happens, hundreds of thousands more people with disabilities will lose their community Medicaid supports and either be forced into institutions or receive no services at all. Ensuring funds are available for community-based services would help to create a network of community providers to support people with disabilities. It would also ensure there is money to pay direct support professionals, thus creating a pipeline of workers to provide the necessary services. The Department of Labor has estimated there will be over a million personal care aides and home health aides needed over the next 10 years. The DIA will promote the growth of agencies to provide support services and help to attract individuals into the field. In addition to community support, we also need to prioritize employment of persons with disabilities, which is key to independence. Employment for people is now an expectation. To make that a reality, we need to remove as many barriers as possible to obtaining a job. One of those barriers is the risk of losing one's benefits. The Stephen Beck Achieving a Better Life Experience Act in 2014, better known as the ABLE Act, makes it possible for those with disabilities to save up to $15,000 a year without risking eligibility to their Medicaid health care and other benefits. ABLE is a first step to encouraging youth with disabilities to work and save for the future. We need to remove more barriers. The current tax bill moving through Congress would eliminate the tax credit to businesses that hire people with disabilities. That is wrong. We should be encouraging businesses to hire those with disabilities, not putting new barriers in place. We also need to ensure adequate funding is in place for vocational rehabilitation services, which help people with disabilities develop the skills they need to find and keep work. And we need to make sure the last three years of school eligibility for students with disabilities are focused on developing skills to be successful in postsecondary education, the workplace, or both. There are many more changes we can make to eliminate the cliff young people with disabilities and their families face when they turn 21. Let's start by making sure services are available in the community and the path to employment is as smooth as possible. By doing so, we'll be filling in that canyon and eliminate the cliff all together.